for use as motor protectors. Here are some questions we need to ask in order to select the best replacement unit. Please provide the full part number of the old unit. What is the machine voltage, the 3-phase power at the main lugs? If it is 480 Volts, we need to know if it is 480-Y or 480-Delta. To determine this, measure the voltage from each leg to ground or neutral. If all 3 are roughly to same, it's 480-Y and if one leg is much higher than the other 2, then it is 480-Delta. Are there any small wires connected to the unit, other than on the main lugs? If so, there may be an undervoltage trip or auxiliary contacts. Look for small labels, marked "Aux. 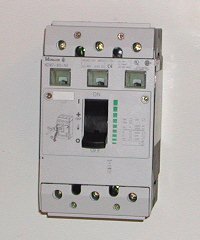 Switch" or "Undervoltage Release" and note the part numbers. If these are present, are you able to provide a copy of the wiring diagram? If your unit is adjustable (the yellow dial on the front), how many amps do you wish to set it to? The new units have different adjustment ranges. - is it located on the door? - is it located on the right side wall of the cabinet? - is it located on the left side wall of the cabinet? - is it located in the back of the cabinet? Each location requires different hardware. Photos of the unit showing the installation and wiring are always helpful.